What Is the Actual Cost of Residential Solar Panels? Here at Solar Action Alliance, we like to inform our readers about all things solar. One of the most pressing questions for somebody that is considering installing solar panels on their home is: what will this cost me? It’s a good question, and one that seems to generate a lot of different answers from a lot of different websites. Some people try to answer by including your savings – but we find that most people are just curious about the upfront cost. If you want to know about the savings you can find by going solar, check out our page on solar savings! We’re going to try and answer this question as simply as possible. How Much Do The Solar Panels Themselves Cost? So how much does an actual solar panel cost? Well, it depends on a few things: how powerful the panel is and who is buying the panels. 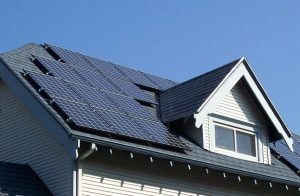 If you are not a solar installer and are considering doing a DIY solar panel installation on your home, you will likely have to pay retail prices for each panel. The general rule of thumb is that installers who buy in bulk pay around $0.85 per watt, while retail consumers pay around $1 per watt. A typical solar panel ranges from 150-350 watts, so for this example we’ll cut right down the middle and use a 250 watt solar panel. If you are going through an installer, you’re looking at around $212.50 per panel (250 watts x .85 cents). If you’re going DIY and buying panels yourself, you’re looking at around $250 per panel (250 watts x 1 dollar). Keep in mind that this is before tax rebates! How Much Will the Whole Installation Cost me? While it can be useful to know the price per solar panel, the real price comes from the entire solar power system and the installation. We are not a DIY-focused site so for this cost analysis we are going to focus solely on installation costs through a certified solar installer. We will do a future post with a full breakdown of these costs, but what is the actual cost of a solar power installation on your home? Let’s start by looking at the average installation. The average installation on an American home is a 5 kilowatt (5kW) system. For 2017, the average cost per watt of solar systems in the US is $3.26 cents. So let’s do the math! If we multiply 5,000 watts by $3.26, we get $16,300. But wait, don’t forget about the Solar Investment Tax Credit! With this credit, you save 30% of your total solar installation cost through a tax credit. When we take this 30% credit out of $16,300, we arrive at $11,410. The average cost ($3.36 per watt) of the average solar system (5 kW) in the United States is approximately $11,410. It’s great that we’ve arrived at the average cost of a solar system installation but as you may have guessed, there are many different factors that influence what the cost of solar would be for you. 5kW is the average size of a solar system, but many people choose to install bigger systems. A bigger system means more energy production and more energy savings over time. Some popular sizes are 6kW, 10kW and 15kW. Of course, it really depends on what your energy needs are. If you have 1500 square foot house and few appliances, your energy needs will be much different than someone who has a 3,000 square foot house with a hot tub! The best thing you can do is run a simple analysis on your energy bill. How much energy do you use? Take that and you can easily decide what the size of your residential solar system should be. The cost of solar installations varies from state to state, however the price of solar is actually fairly steady across the board. Almost all states tend to fall within 50 cents of the $3.26/watt average we discussed earlier. Where you live certainly affects your solar savings (how much you save by going solar) but that is a topic for our aforementioned solar savings page. Energy Sage also has a great breakdown of state by state solar installation costs! Some roofs are built perfectly for a solar system installation. Others, well, just aren’t. Some may have extremely steep roofs, multiple levels, or skylights that need to be accounted for. These can certainly affect the overall installation costs. This is a BIG factor. You can get a wide range of different quotes from different installers. Some may use more efficient equipment and thus charge more. But some may simply spend more on marketing and advertising and pass on those costs to you. We recommend that you thoroughly research and get quotes from multiple installers before choosing on one that you can trust. Or, you can get connected directly with a Solar Action Alliance trusted installer. These are installers that we’ve vetted to make sure they are providing the best installations for the lowest price. Just fill out the form below! We hope that this cost analysis helped you get a grasp on the expenditures that go into installing a solar panel system on your residence. It really all comes down to how big of a system you want and what installer you go with. But regardless, solar prices are down across the board in 2017 and the costs have literally never been lower to make the switch. We are extremely excited about the future of solar and see the prices continuing to decline, offering great opportunities for customers to do their part in saving the environment and saving on their energy bill in the process. Check out state and city specific solar information on our state pages!